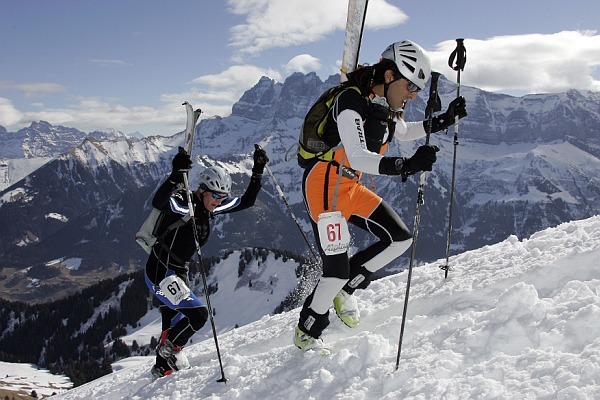 From November to March I turn my attention from mountain running to ski mountaineering racing, a budding sport in the US, with deep, deep roots in Europe. Since the WWII the Europeans have been hosting enormous and often very committing races climbing and descending on skis deep in the Alps. 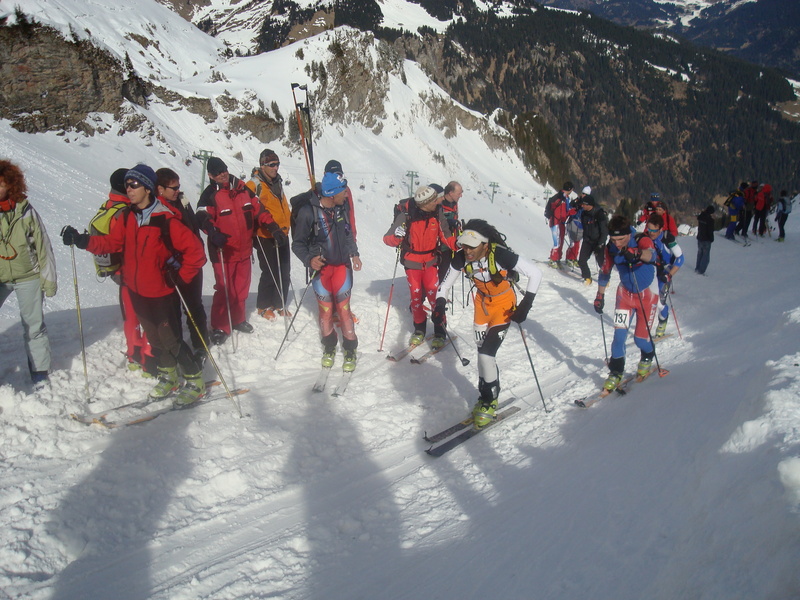 The races involve skinning up several thousand feet before ripping skins and descending steep faces and tight couloirs. 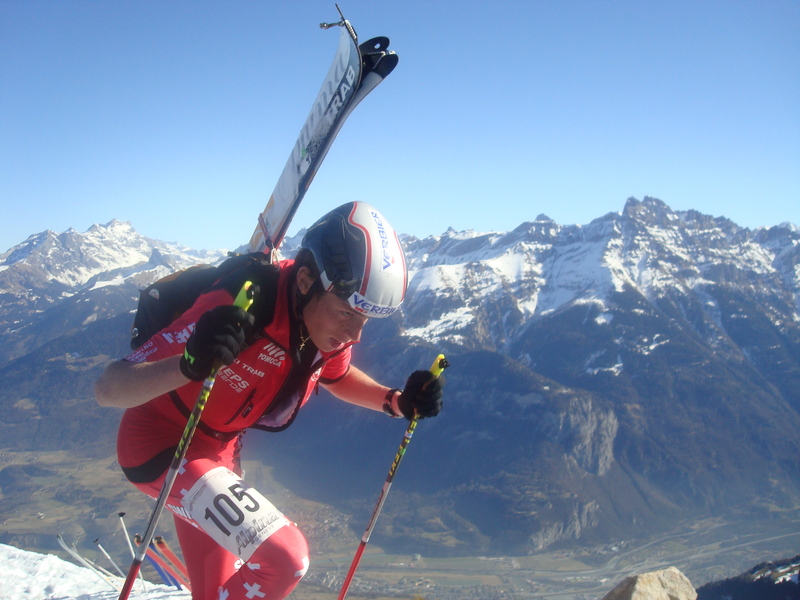 Though strong downskiers can make up time on the descents–the race is won or lost in the climbs. The sport is still in its nascent stages in the US where races are often shorter, but at higher elevation in colder temperatures. This last winter I had the great fortune of being a member of the US National team that competed at the World Championship in Champery Switzerland. The opportunity to compete at a World Championship level was tremendous, especially since this sport is dominated by the Europeans–who did not dissappoint with stellar performances. I raced the team relay, which took place at night under flood lights with a huge core of spectators. This was a very short race involving two 7 minute laps on a skinning and booting course. Early the next morning my teamate Steve Romeo and I raced the Teams event together, a crushing 3 hour event, with 6 climbs and 3 steep booting sections. My last race was the vertical– a hill climb event. Over dinner and while roaming around town I met many competitors from around the world, including numerous members of the La Sportiva Teams of Europe. This entry was posted on April 27, 2008 at 9:12 pm and is filed under News. You can follow any responses to this entry through the RSS 2.0 feed. You can leave a response, or trackback from your own site. Good report on a cool sport.